Dominic Guzman founded the Dominican Order in Prouilhe and Toulouse in Southern France between 1206 and 1216. Now referred to as 'The Dominican Family', the Order comprises Friars, Sisters, Nuns, Dominican Lay men and women, the Dominican Youth Movement, Dominican Volunteer Movement and countless other groups, in 108 countries, who lay claim to the charism of preaching the gospel. The Dominican Mission, which we proudly inherit, is to Praise.... to Bless.... to Preach.... the God of love. St. Dominic’s Parish is of historical importance as the first location of the Dominican Order in Victoria. It is also a rare example of a Catholic parish in Melbourne that is run by a religious order. While the construction of the church-school was underway, arrangements had to be made for its use as a school at least at the beginning of 1925. The first enrolment was small, between thirty and forty children, with an age range from five years to twelve or thirteen. The school opened in February 1925 and was staffed by lay teachers whilst Dominican nuns were sought. The lay teachers generally arrived by tram so the children found they could play around the green tram shed in Wattle Valley Road until the Teachers’ Tram came over the hill from the Junction. It was during the third term of 1926 when the Dominican Sisters took over from the lay teachers. Four pioneer Dominican sisters from West Maitland, New Zealand, Mother M Concepta O’Donoghue, Sr Loreto Cockerill, Sr Perpetua Hermann and Sr Placid Flaherty arrived in Melbourne on August 12, 1926. Fr. Powell blessed the Sisters and took them to the St. Dominic’s School… they were welcomed to reside at Siena Convent which became the first foundation in Victoria for Dominican nuns. For years the men of the parish came to St. Dominic’s on Friday nights to prepare the building for Sunday. This meant the removal of the heavy school furniture to be replaced by the still heavier church pews which were stacked in a shed where the lawn is now. After the ten o’clock Mass on Sunday the reverse process had be carried out. This back-breaking exercise went on until the first section of the new church was opened in 1937. 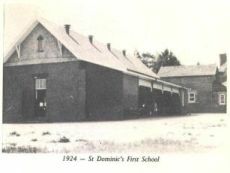 The Dominican Fathers were responsible for the building of the new school, situated at Highfield Road, of which the Dominician nuns had charge. The blessing of the new St. Dominic's was performed by his Grace Archbishop Mannix on October 8, 1939. The school opened with 230 children enrolled. During the war years 1939 – 1945, air raid trenches were dug alongside the northern boundary from the milkshed, then known as the bike shed, up to where the northern adventure playground is now sited. At that time the playground was not asphalted. From 1941-1945 the main hall of the school was used for fortnightly Saturday night dances. Please click here for St Dominic's Primary School History photos.